BI-ANGULAR PRESS ARMS: Our patented Bi-Angular® Press Arm guide you through the optimal range of motion while applying resistance from two directions. The smooth, multi-directional resistance increases muscle interaction by 25%. Enjoy the benefits of Bi-Angular® Technology when doing chest presses, incline presses and shoulder presses. It’s like working out with free weights. LAT PULLDOWN / HIGH PULLEY STATION: Perform lat pull downs, triceps press downs, cable crossovers and many more high pulley exercises. Adjustable hold down pads stabilize your body for lifts beyond your body weight. Unique versatility allows you to increase the strength and endurance of your back muscles. AB CRUNCH / MID PULLEY STATION: Develop awesome abs and terrific triceps quickly. Biomechanically engineered for smooth, comfortable, full range of motion crunching movement. Specifically designed for firming, flattening and isolating the entire abdominal area. 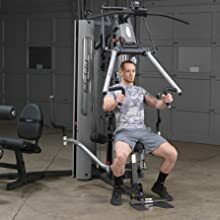 PERFECT PEC STATION: Equipped with swivel arms and designed for both unilateral and bilateral movements you get the maximum stretch for deep muscle toning, and the most incredible upper body development possible. LEG EXTENSION / LEG CURL STATION: Build muscular legs and stronger knee joints. The leg developer’s SmoothGlide Bearing System™ combined with the self-aligning leg cuffs guide you through the most demanding leg curls and leg extensions. An independent weight stack allows more than one user can workout at a time. 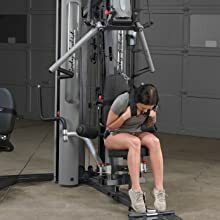 SEATED ROW / LOW PULLEY STATION: Essential for well-developed backs, seated row exercises build depth in the middle back and train the hard to reach lower lats. 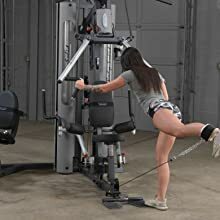 Low pulley swivels smoothly and fully to provide accurate resistance for cable curls, upright rows, shrugs, leg abduction, leg adduction and much more. POWDERED BY A 210 LB. ALLOY WEIGHT STACK: Advanced alloy weight stack plates are machine drilled to exact specifications and employ state of- the-art nylon bushings for super smooth and quiet operation. The Bi-Angular press arms of the G10B guide you through the optimal natural range-of-motion while applying resistance from two directions simultaneously. This smooth, fluid, multi-directional resistance system automatically produces 25% more muscle interaction by eliminating the ability to rest your chest muscles. Thus, you increase the exercise intensity through a full range of safe, convergent, multi-joint, multi-plane movement patterns. Seated Chest Press, Seated Shoulder Press, Incline Press. Seated Fly with Fly Arms. Lat Pulldown, Tricep Extension, etc with High Pulley. Leg Extension / Seated Leg Curl. Seated Row, Cable Curls, Upright Rows, Shrugs, Leg Abduction, Leg Adduction, etc. Ab Crunch, Oblique Crunch, etc.